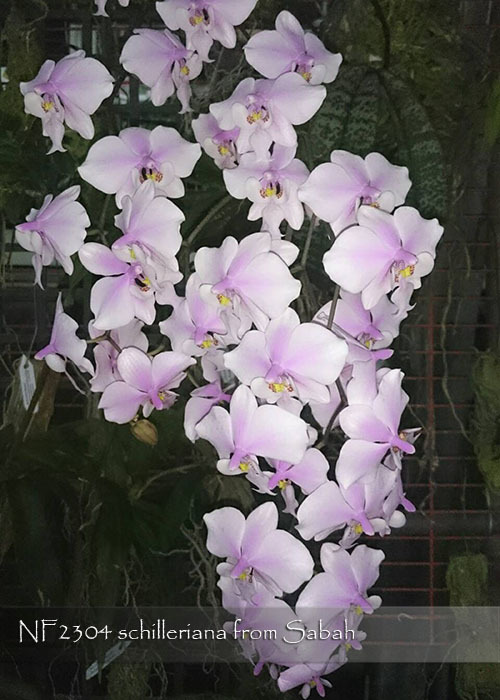 One of the most sought-after and popular of all Phalaenopsis species, Phal. schilleriana produces astounding displays of gracefully cascading fragrant flowers ! This particular strain comes from the Malaysian state of Sabah in the northeast section of the island of Borneo. The Sabah strain produces large plants with huge showy branching flower spikes and beautifully mottled foliage. And after the flowers have faded, they often can produce a keiki at the end of that spike, a trait that is typical for this particular strain from Sabah. Highly Recommended !